Mice are any of the species of rodents belonging to the taxonomic genus Mus. They are perhaps best known as a pest for their tendency to invade people's homes. Mice often live in man-made structures like farmhouses, sheds, and even stores. Wherever there is a ready and open food-supply, mice will show up. They have a short gestation period of only twenty days and a mother can have up to twenty-four pups. The pups also mature quickly and are soon able to mate themselves. For these reasons, mice reproducing quickly making extermination all the more necessary when household notices and infestation. Although they are often despised, mice are very vital to the environment. They provide food to many animals to keep the ecosystem balanced like it was made to be. 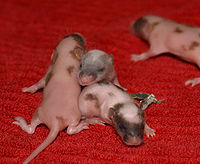 These are three pups about one week old, still blind but with ears open and color just appearing on their skin. 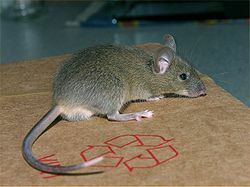 Mice are often seen as pests, which they are to humans. They get into people's homes, carry diseases, and eat our food, but they are also very helpful in balancing our ecosystem. Mice serve as so many different animal's food source. With out mice, many animals would not have enough to eat. Mouse skeleton in an old mouse trap from 2008. Mice can be very smart animals! Like finding their way into a house, they can find their way out of a maze. ↑ Facts About Mice Buzzle. Web. 26 February 2013 (Date-accessed). ↑ Senses and Communication Humane-Endpoints. Web. 27 February 2013 (Date-Accessed). ↑ Mouse Facts The Fun Mouse. Web. 11 February 2013 (Date-Accessed). ↑ House Mouse EnCon. Web. 11 February 2013 (Date-Accessed). ↑  Orkin. Web. 11 February 2013 (Date-Accessed). ↑ Pagad, Shyama. Mus Musculus Global Invasive Species Database. Web. 17 September 2010 (Date-Published). ↑ Mouse (Harvest) Young Peoples Trust. Web. 22 February 2013 (Date-Accessed). ↑ What Eats A Mouse What Eats. Web. 7 April 2010 (Date-Published). ↑ Mice in Homes Web. 11 February 2013 (Date-Accessed). ↑ Clean Up Web. 11 February 2013 (Date-Accessed). ↑ Mice Extermination Web. 11 February 2013 (Date-Accessed). ↑ Mice in Walls Web. 11 February 2013 (Date-Accessed). This page was last modified on 29 October 2015, at 19:22.